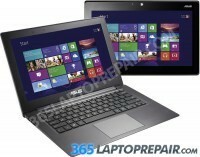 You can send us your Asus Taichi 21 for repair and one of our experienced technicians will fix it for you! The replacement service that we provide for the Asus Taichi 21 includes the cost of a brand new LCD screen assembly which contains both front and back screens and the labor to install it. This service also comes with a No Dead Pixel Guarantee and a 6-month warranty on parts and service. We use genuine new LCDs, not aftermarket or cloned products. We will not replace only the damaged screen but the entire screen assembly as the inside LCD bezel is held in place with glue, so it is more complicated than most other screen replacements. The outside LCD screen is a glass/digitizer and LCD screen combined assembly. Asus Taichi models have a complementary one time free LCD replacement which is covered under accidental warranty directly from Asus. This is within 2 years of purchase which as of May 2016 is not valid as most of these models are past 2 years currently. This laptop comes stock with a 256 GB Solid State Drive (SSD). This laptop uses a unique type of SSD. Because of this, please request a Custom Quote this repair. This laptop comes with 4GB of integrated memory. It does not have a slot for more memory so it can not be upgraded.